World Cuisine Express offers full service catering at your home, office or for your special event: Dinner Party, Cocktail Party, Graduation, Birthday, Wedding, & Anniversary. We now also offer Vacation Catering. Where can you find Chef Harold? Stop by Harold's Caribbean Kitchen, inside the Tony Ray cafe at de la Guerra Plaza for some authentic Caribbean islands cuisine. All meals are fresh-cooked, made-to-order, and personally prepared by the World Cuisine Team. 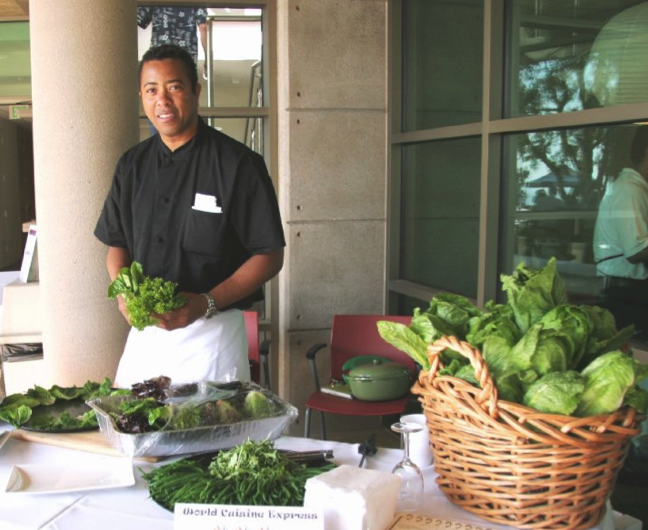 All ingredients are local and organic when possible, never frozen, and carefully prepared by Chef Harold Welch. Who can enjoy this? Anyone! Treat yourself to a couple days of no-cooking; surprise your friends with a delicious gourmet meal outside at de la Guerra plaze; ease up your weekday routine with a quick and simple delivery from World Cuisine Express. It really doesn't get any better than that. Fine wholesome gourmet food for people who care about what they eat!